I’m about 24 hours late, but here it is, with only a few missing nails and screws. Thanks for your patience as I return to something like a regular schedule. The next page will go up as soon as possible. Marvelous. As always your depiction of detail is on point, something a person could read a great deal of times and never grasp entirely. I especially like the contrast of panel three; The strength of the shadow and the seeming slitted eyes of the Host. Thank you, I hope you like the rest of the comic (just four more pages!) 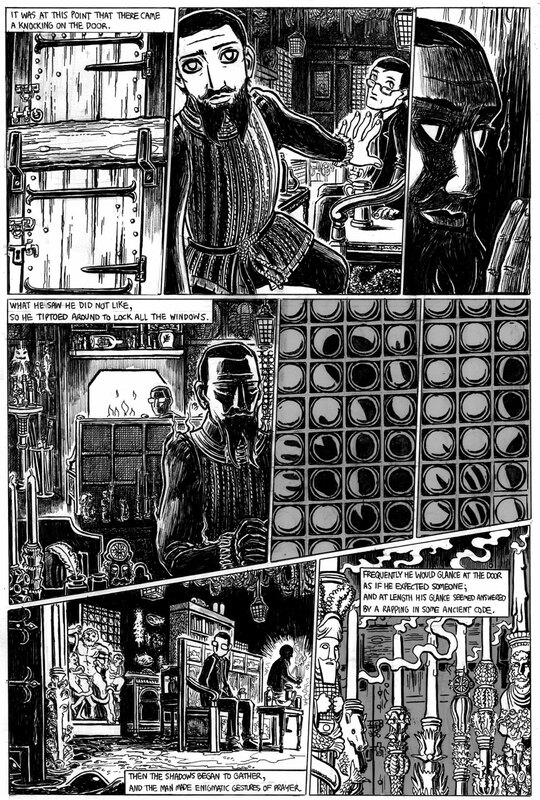 I actually like Lovecraft stories like this one, “The Green Meadow” and “The Transition of Juan Romero” where the weirdness is never fully explained, where the mysteries seem to be like pieces of an unsolvable puzzle. I’d like to think that Lovecraft himself had an idea of what was going on in these stories (rather than just copping out with vagueness), for I, in the process of drawing them, certainly have come up with my own theories. in this way, “Strange High House” reminds me a bit of Lord Dunsany… I’d say Jorge Luis Borges too, but I might be kidding myself. Came here as a result of your post on the Eldritch Dark. Of HPL’s stories, “Dream Quest of Unkown Kadath” and “Strange High House” are my favorites. I’m also a fan of manga, so when I saw you were doing a comic on “Strange High House,” I just had to check it out. This type of story is tough to do in sequential art, but you’re pulling it off magnificently. The artwork, level of detail, character designs, perspective, use of light and shadow—all top notch. And Olney seems to me to bear a strong resemblance to HPL himself. Was that your intention, or am I just reading too much into it? Keep up the great work; looking forward to the next installments. Thanks Affrit! Yes, Olney is supposed to have a resemblance to HPL — I think most of HPL’s protagonists were proxies for him. In Strange High House, the most unusual thing is that the main character has a wife and a job, and it’s worth noting that the story was written not long after Lovecraft left Sonia Greene and moved back home to Providence from New York. Unfortunately I’m running late on the next page, but it should be up by the end of the weekend! youre artwork matches the tome of the story perfectly, i eagerly awit more. Unfortunately I wasn’t able to finish the page before I left town for Thanksgiving, hence the delay. But I’ll have a new page up by Thursday, December 3rd. Jason, I’m already picturing the completed story in a slim, hardbound volume (with a gold-stamped spine), complete with a Ramsey Campbell introduction and HPL’s prose version in the appendix, along with your comments and preliminary sketches. This adaptation deserves a lavish presentation! ‘appy Chris’mas, mate, and I hope the strain of keeping up all this artwork isn’t finally getting to you, (and as a fellow artist I know whereof I speak!) – thanks! Thanks Alan and Ken! Sorry I’ve fallen victim to delays again. I’ve had a busy last couple of weeks. You continue to impress me, Jason. One of my favorites in my collection is your Hyperborea. The artwork is simply breathtaking in its detail. When I look at art like that, I feel completely sucked into the world it depicts. It’s as if it’s “more real than reality”, if you know what I’m saying. I’m really enjoying this project and thing you’ve been doing a terrific job. I’ll also say don’t sweat the delays. This kind of thing looks quite labor intensive and it would be a shame to rush it. Two of my favourite webcomics that I follow (this one and One Swoop Fell) stopped updating in November. :( Anyway, I’ll be waiting anxiously for your return (and for that Kadath collection). I really enjoyed this. Actually its a good place to end this, if you have. It makes me want re- read the story. Thanks. How are things going? Are you working on a timeline for 2010? I’d like to see this completed too. I’ve been loving the art work. But I did give up waiting and read the original :) Which was very good. But I’m still loving the comic version. I quite agree, I think this adaptation is great. I hope to read the rest of it soon! Jason, I’m still noticing new details in your panels! I think I can see trilobites and Jenny Hanivers decorating the walls of the strange high house in panel four. Just wonderful! Whoa! Ken Kobori is right. That’s the Laocoon Group on the bottom left. One day we will see this comic rise from the printers grave. September is the new March. Everybody, I’m sorry. I know I have totally dropped the ball on my commitments and deadlines with this comic. Part of it was losing my portfolio with my thumbnails and partially completed remaining pages back in January, but that doesn’t make up for the other 8+ months. I won’t throw out another deadline that I might miss, but I do intend to finish this comic (and do at least one more Lovecraft adaptation) so please consider me “totally flaky, but not dead” for now. This comic is wonderful! The panels where Olney is traveling through the woods to the cottage (especially the one with the inset showing how far he has come from his homey front porch) have brilliant depth and points of view. The scary silhouette against the old bullseye window is awesome, too. I will wait patiently for you to wrap it up — this was one of my fave Lovecraft stories. Really nice work…a lot of thought and care is apparent in every panel. I can understand why losing your portfolio and thumbnails would have really set you back…there’s got to be quite a bit of prep for a gem like this…. Jason, I can imagine Ernest Hemingway wincing in the next world! But I feel confident that the end of the story will be worth the wait (however long delayed). Just dropping a line to say that your work here is great and I’m looking forward to seeing the end of it, as well as your take on Celephais. Jason, I just read HPL’s Celephais! It’s one of the few Lovecraft stories I’d never read for some reason. (The Dream Quest of Unknown Kadath is another–I’ll get around to it one day. It’s always good to have an unread story by a favorite author in reserve). I found it rather autobiographical, at times ominously so–particularly the ending. It’s interesting that you chose this HPL story to adapt–any particular reason? I’m really looking forward to buying your Kadath and other Lovecraft adaptation graphic novel when it exists! I can’t believe that no one pointed out Laocoon and his sons fighting the serpent, the statue. Isn’t that from Tiberius’ Grotto? … I can’t remember the name of the style at the moment.